You are currently browsing the tag archive for the ‘Reggae on the River’ tag. 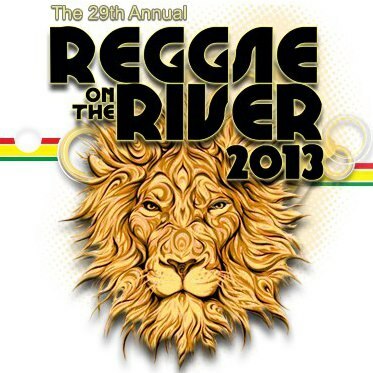 Get your 29th Annual Reggae On The River™ 2013 tickets now…. Online and Local Outlet Tickets are NOW ON SALE For Highly Anticipated French’s Camp Homecoming! Online sales will close at 8am on Wednesday July 31. Tickets (if still available) will be henceforth available at the gate only. 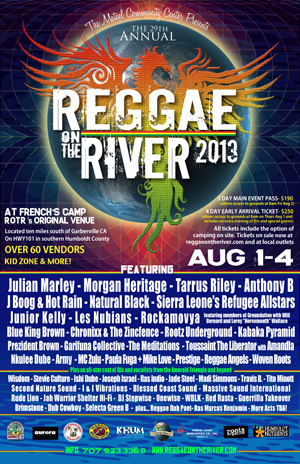 Don’t delay in planning your pilgrimage to the 29th annual Reggae On The River™ on August 1-4, 2013. Making a highly anticipated return to the festival’s original French’s Camp venue, located approximately 10 miles south of Garberville in Humboldt County, CA, reggae fans worldwide are overjoyed at the news of the festival’s homecoming and tickets are flying out the door! ~ $250 – 4-day early arrival ticket. Allows access to festival grounds at 8am on Thursday, August 1, plus an extra evening of DJs and special guests. ~ $190 – 3-day main event ticket. Allows access to the festival grounds at 8am on Friday, August 2. ~ $250 – RV parking. A limited number of additional RV spaces have recently been allotted. These were recently sold out, so get yours now! Don’t miss this historic homecoming celebration! Stay tuned to this website or www.reggaeontheriver.com for all the details and be sure to join the ROTR newsletter where we’ve been offering a weekly sneak peek into all the epic talent in store for this very special Reggae On The River™ homecoming celebration. For more information call the Mateel office at (707) 923-3368 or send an email to office@mateel.org. Passed 4 to 1. Despite the opposition from a local business owner concerned that he wouldn’t make enough money with the plan as is. According to the Times Standard article, Supervisor Rex Bohn dissented, but the article doesn’t explain. In fact, later in the article Rex is quoted as dismissing the appeal from the business owner as “economic issues” that can’t be addressed. Does anybody know why Rex voted against? Interesting to see that the CHP estimated 25,000 in attendance at previous events. The cap this year is 8000. Why: Internationally renowned celebration of reggae & world music! 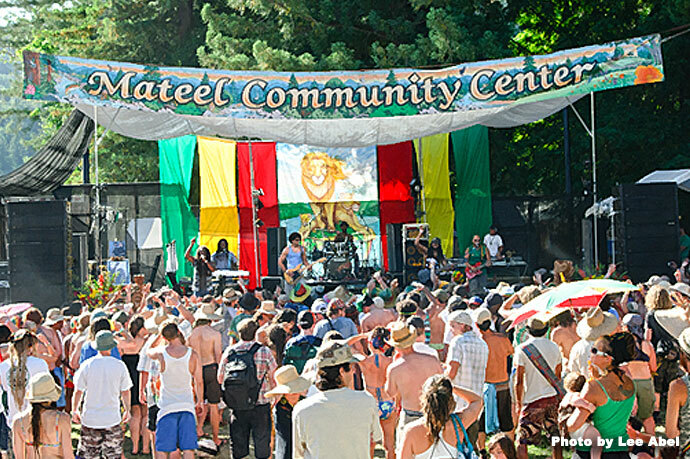 On the weekend of July 16th and 17th, 2011, the Mateel Community Center is proud to present the 27th annual Reggae On The River at Benbow Lake State Recreation Area in southern Humboldt County, CA. An internationally renowned showcase of the best in reggae and world music, this year’s event will feature two stages (an ROTR first!) and is shaping up to be a good one. Though the full line-up is not totally complete, a list of the confirmed acts so far includes Ky-Mani Marley, Gramps Morgan, Seun Anikulapo Kuti & Egypt 80, J Boog, Tony Rebel, Queen Ifrica, Bushman, Gondwana, Rootz Underground, Annette Brissett, Perfect, Clinton Fearon, Army, HR, Edi Fitzroy, Pashon Minott, Indubious, Zili Misik, SILA, Sahra Indio, Native Elements, The Alliez, The Impalers, Jah Sun & Ishi Dube w/ Redemption Band, Jade Steel, and Ambush, with several acts still TBA. 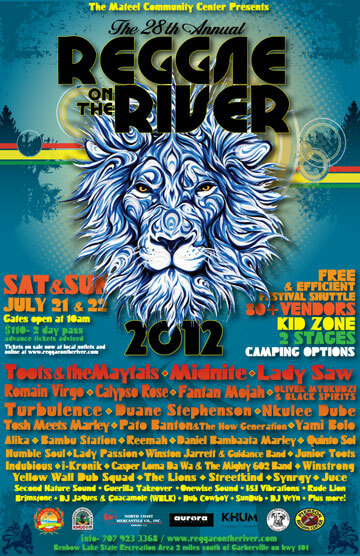 Weekend passes are currently available online at www.reggaeontheriver.com and at the usual local outlets in Humboldt and Mendocino Counties. Advance tickets are advised as this event sells out. Single day tickets will go on sale June 15th if the event is not sold out by this point. 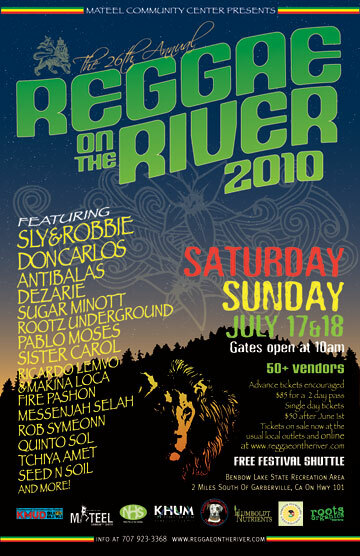 For more information on the 27th annual Reggae On The River visit http://www.reggaeontheriver.com or call (707) 923-3368 and be sure to make your plans soon to join the festival fun on the weekend of July 16 and 17. Tons of vids posted at Youtube this year. Addendum: Is the driver the cameraman? Doesn’t that make you feel safe driving 101? I think tickets are still on sale, though given the other news they probably won’t last long. More details at the Mateel website. Here are some youtubes of Reggae on the River 2009, the one that bagged the Mateel 80 grand.